When Theresa May announced on 18 April that she planned to call a "snap" general election, it surprised almost everyone. It had been only two years since the last UK-wide poll, won by Mrs May's predecessor, David Cameron. And under the relatively recent Fixed-Term Parliaments Act, another general election had not been due until 2020. On top of that, when she had been asked whether she was tempted to capitalise on her healthy poll ratings and go to the country, Mrs May had given an emphatic "no". "I think the next election will be in 2020... I'm not going to be calling a snap election" she told the BBC's Andrew Marr in September 2016 . But that all seemed to change over the course of the Easter break. 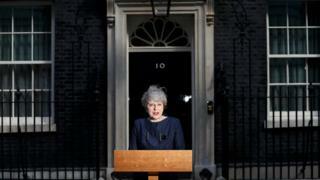 As Britain went back to work on the day after Easter Monday, Mrs May stood on the steps of Downing Street to deliver her surprise call for an election. Her stated reason was to strengthen her hand in Brexit negotiations. With official Brexit talks with the EU due to start in mid-June, Mrs May claimed Labour, the SNP and the Lib Dems would try to destabilise and frustrate the process in Parliament. "If we do not hold a general election now, their political game-playing will continue," Mrs May said in her address to the country, "and the negotiations with the European Union will reach their most difficult stage in the run-up to the next scheduled election." The timing was important in Mrs May's mind. Unless all sides agree to extend Brexit talks, the UK is due to leave the European Union on 29 March, 2019. As things stood, that would have given the government little more than a year to show the deal it had achieved was working before the next scheduled general election. By gaining a fresh five-year term in 2017, Mrs May could look forward to a longer bedding-in period for the fruits of her negotiations. The extra time could be used to negotiate free trade agreements that are seen as critical to the UK's post-Brexit future. But while navigating Brexit was her declared reason, many political commentators believed Mrs May couldn't resist the opportunity presented by the opinion polls. A flurry of polls around the middle of April showed the Conservatives about 20 points ahead of Labour. And if her poll ratings were to be believed, she could have expected to be returned as prime minister with a greatly strengthened majority in the House of Commons. There was even talk of a Tory landslide victory when some polls early in the campaign showed a 20-percentage point gap between the Conservatives and Labour. A beefed-up majority would have made her less vulnerable to the whims and demands of her own backbenchers if they didn't like the way the government's negotiations were shaping up. Such division in Parliament would "risk our ability to make a success of Brexit and it will cause damaging uncertainty and instability to the country", she said. "Every vote for the Conservatives means we can stick to our plan for a stronger Britain and take the right long-term decisions for a more secure future." However, that hope looks to have been dashed. A BBC forecast of election results says the Conservatives are at risk of losing their overall majority, while remaining the largest party in Westminster. If that were to happen, Mrs May's gamble on a snap election will be seen as a very poor decision.